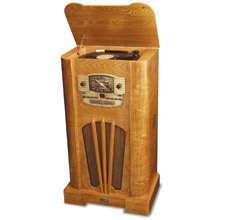 In the late 1940's and early 1950's a vast majority of sound reproduction systems were either entertainment center consoles or floor-standing radios. These systems were generally expensive with more focus on the wood cabinets than the components inside. Component-based systems were almost the exclusive province of hobbyists and professional audio system installers. Radio parts distributors and radio stores supplied components primarily for kits, but many companies such as Acrosound, Dyna, Heath, Allied and H.H. Scott manufactured complete kits and finished products. What were consumer's options in the late 1940's and early 50's if they wanted to buy a hi-fi system? Compared with today they were severely limited. Audiophiles could have purchased a McIntosh power amplifier as early as 1949. McIntosh's first product, designed by Frank McIntosh and Gordon Gow was the 50W-1 basic power amplifier. It was created to solve a client's need for a high power low-distortion amplifier that was stable even under difficult impedance loads. Many early McIntosh tube amplifiers were made for medical and industrial uses rather than sound reproduction. Most of the companies that made audio gear in the late 1940's and early '50's have completely ceased to exist or are no longer independent commercial entities. Pedersen Electronics is a case in point. Pedersen produced a complete line of audio components including tuners, preamps, and power amps in the mid '50's. Despite the catchy ad phrase "PDQ - Pedersen Denotes Quality", by 1959 they were no longer listed in Audio Magazine's annual product review issue. In all my years at audio flea markets and radio club swap meets I've never even seen a Pedersen audio component. Rarity, if you're a manufacturer, is not a good thing. Saul Marantz's first product, the $143.50 Audio Consolette, appeared in 1955. Audio Magazine wrote, "It merits respect not only for its fine performance...but in itself as a fine example of good engineering and construction." Its design included two separate high-gain phono pre-amp input circuits and 36 possible EQ curves for the phono section. H.H. Scott entered the audio game in 1947. His first commercial product was "The Dynamic Noise Suppressor." It revolutionized radio because it made it possible, for the first time, to play 78 RPM records over the air without the ticks and pops blowing up radio transmitters. Scott continued making a Dynaural Noise Suppressor through 1956, when the model 114A was finally discontinued. Fisher Radio Co., was Scott's principal rival for many years. Its creator, Avery Fisher, began Fisher Radio in 1945. Today he is better known for his philanthropic gifts, such as New York City's Avery Fisher Hall than his technical ones. But under his direction Fisher Radio remained a technology leader right up to 1969, when he sold the company to Sanyo. Harman Kardon's first audio products were more high style than high-tech, with easily removable faceplates available in a variety of designer colors as their principal selling point. But it wasn't long before Sidney Harman hired Stu Hegeman as HK's head designer and the Award Series and Citation line of kits and factory assembled separates was born. Citation enthusiasts strive to collect all five models in the Citation tube line. The model 1 was a preamplifier, the model II was a power amp, the model III was a tuner, the model IV was a preamp, and model V was a power amplifier. Across the pond Leak audio had been making audio-related products since 1934. In 1946 Leak introduced their first "Type 15" audio power amplifier, which drew upon "wartime research" for its four stage, negative feedback design. It was soon replaced by the very popular and long-lived TL/12, which Leak continued to build for many years. Another British company, Quad was founded by Peter Walker in 1936. Although better known today for their speakers, Quad's first commercial product was a power amplifier, the Quad 1. It wasn't until 1956 that Quad unveiled their first speaker, the legendary ESL57 which remained in production for twenty-eight years. By 1950, Bozak was already a market leader in speakers. Bozak sold complete speakers, such as their "Kettle Drum" model, so named for its kettle drum-shaped enclosure, hemispherical "tympani" baffle, and ability to deliver "true pitch tympanic bass." Bozak also made a line of speaker components, which included the B-100 dual-tweeter configuration and a matching B-199 midrange/woofer. Bozak's competition in the early 50's included several companies that are still making loudspeakers today. By 1950 Altec Lansing was manufacturing their own array of drivers. Their 1950 catalog included the 603B multicell dia-cone full range driver, 604B duplex speaker, 600B 12" full-range driver, 400B 8" full-range driver, and an array of cabinets designed to accommodate their raw drivers and crossovers. Jensen was also making speakers in 1950. Their H-510 coaxial design cost $135 and ad copy boasted of "a scientifically designed wide-range acoustic lens...for improved special (SP) distribution of upper frequency information." Other speakers in the 1950 Jensen line included the K-410 ($94.25) and K-310 ($56.25) coaxial speakers as well as full range single drivers ranging from 15" all the way down to 5". Jensen also made a "control network" or what we would refer to today as an active crossover, called the A-110 for $26.50. Just as some companies specialized in speaker components and drivers others concentrated on building cabinets for audiophiles who were less than handy with carpentry. Brooklyn NY's Karlson Associates made cabinets for 15", 12" and 8" drivers. Their floor standing "12" enclosure was available in three different heights to accommodate its secondary use as an end or coffee table. To give you an idea of how quickly the early hi-fi industry was growing, University, who specialized in speaker components rather than fully assembled speakers, expanded their line of drivers from only five offerings in 1950 to over 35 different drivers in 1952. University covered everything from PA speakers to "Explosion proof" full range drivers. They also made crossovers and coaxial designs. University products were generally less expensive that their competitors and as a result, their speakers can often be found as OEM equipment in many vintage musical instrument amplifiers. In England the Lowther Speaker Company was making raw drivers such as the Type P.M.2, which had a published frequency response capabilities from 18 to 20KHz and only cost $135. Lowther also made "the Horn Cabinet" which was a corner-loaded cabinet based on a "tractrix" curve in its horn design. At $225 I suspect that most Lowther owners did then what they do today - build their own cabinets. Another venerable British speaker company, Tannoy, was already importing their 12" and 15" "Dual Concentric" into the United States by 1952. With their nominal 15-ohm impedance the Tannoys were easy to drive with the small triode tube amplifiers that were so common at that time. By 1956 the market had expanded, with Stephens Trusonic's line of "two-voice" coaxial speakers, conventional coaxial and multi-driver kits. The $133.50 206AXA was Stephens top of the line coaxial driver, featuring dual voice coils and a 7½ lb. Alnico V magnet. Stephens most elaborate multi-driver system, priced at $269.25, was the 803 which included a #216high frequency driver and two 103LX low frequency drivers, a 824H high frequency multicellular horn and 800X electronic crossover. Acoustic Research, better known by their initials, AR, started with a hand-built prototype acoustic suspension speaker built in Ed and Rosemary Villchur's kitchen. This prototype was pictured in an October 1954 article in Audio titled "Revolutionary Loudspeaker and Enclosure" by Edgar M. Villchur. Villchur is credited "President, Acoustic Research Inc., 23 Mt. Auburn St., Cambridge 38, Mass." And so from tiny acorns, the era of the acoustic suspension speakers began. Acoustic suspension or sealed enclosure design, simply outperformed all the other speaker designs available in the mid-50's and it revolutionized the industry. Because acoustic suspension speakers are far less efficient than Open baffle and horn speakers, they require more power to function properly. Instead of a 5-watt single-ended triode tube amplifier, an acoustic suspension design needs at least a 35-watt ultra linear amplifier, if not something even bigger. But what? The what was transistor amplifiers. Using transistors, electronics manufacturers could economically produce power amplifiers with far higher power output than they could using tubes. KLH was created by Henry Kloss, Malcolm Lowe, and Abe Hoffman in 1957. They had all come to work at AR together, so when it became clear that Henry Kloss was, in Ed Villchur's words, "presidential timber" and since Villchur was already the president of AR, they all agreed to leave AR and start their own company. The trio from parted from Villchur on good enough terms that KLH was granted permission to license AR's acoustic suspension and dome tweeter technologies for their own speakers. The 60's saw several important technical innovations that profoundly influenced the direction of home entertainment systems. Stereo, which had barely begun in the late 50's, became the dominant reproduction method in the 60's thanks in large part to the one-two punch of stereo long playing records and FM radio. Reel-to-reel tape recorders, which had been the primary means for audiophiles to enjoy stereo recordings in the late '50's, faded away during the 60's and 70's as turntables, tonearms, cartridges and FM tuners got better and fewer recordings were offered in the reel-to-reel format. The very first stereo radio broadcasts were in the late 1950's, but they were primarily experiments. For these stereo broadcasts you had to set one channel on an FM station while the other was on an AM station. Scott, made a dual-band tuner, the 330, which was set up so you could get AM in the right channel and FM in the left. The first true stereo FM tuners that used the multiplex system of stereo decoding didn't hit the market until 1962. Some, like the Fisher MPX-100 with its "stereo beacon" and adjustable stereo balance control, were meant to be placed beside a tuner, while others, including Leonard Feldman's MX-101 FM-Stereo adapter (his assembly instructions were published in his article in the July 1961 Audio Magazine. These first units were separately-chassisied outboard units that attached to the "multiplex out" via RCA connectors. Once stereo FM broadcasts became the norm, the market for FM tuners grew exponentially. Also an entirely new product appeared, the receiver It incorporated a tuner, preamp, and power amp in one chassis. Cheaper to build and more home-friendly than separate components, the receiver quickly dominated the market, so by the late 60's only audiophiles and pro sound engineers even considered separate tuners, preamps and power amps. The other important trend in the 60's was brought on by the usurpation of the role of the vacuum tube by the transistor. Japanese hifi firms hadn't seen much success with their tube-based designs in the early 60's.But with the advent of the transistor Pioneer, Yamaha, Sony, Sherwood, Kenwood, and Sansui, all entered the US market with products whose specifications far exceeded those of US-made tube-based components. Of course 20-20 hindsight shows that these specifications used THD or total harmonic distortion figures rather than breaking down the harmonic distortion into 1st, 2nd, 3d, and 4th order harmonics. If they had, audiophiles would have seen how the distortion characteristics of early transistors were much worse at higher odd-order harmonics than tubes. Many audiophiles switched from tube electronics to solid-state electronics and discovered that the sonic results weren't a step up in quality or enjoyment. But despite the transistor's now-obvious-to-us shortcomings, by 1963 even the most steadfast tube-supporting firms had introduced solid-state components. Harman Kardon used the phrase which I've always attributed to Stu Hegeman, "Straight wire with gain." in their ads for their first solid-state, Stu Hegeman-designed pre-amp, the Citation A. I once owned one. It was not a sonic knockout. But the Citation A had a marvelous circuit layout that employed easily removable sub-circuit boards. They slid in and out of the main chassis so that faulty transistors (of which there were far too many at first) could be easily replaced. With transistors and receivers you have the devil's backbone of what came to be known as the mid-fi market. Stores like Harvey's Electronics, The Audio Exchange, and Sam Goody's ran weekly adds in the back of the entertainment section of the New York Times with pre-packaged stereo systems consisting of a turntable, cartridge, receiver, speakers, and the wires to hook them all together for either $299, $399, or $499. My first stereo came from Sam Goody's. It had a Scott solid-state receiver that blew up after only five minutes. When I brought it back to Goody's the salesman up-sold me to a Harman Kardon Nocturne receiver I had that receiver from high school through college. Everyone else I knew had something similar. That's a lot of Garrard turntables, Pickering cartridges, and AR 4x speakers going from apartment to apartment. During the explosion of companies that came and went, some small specialist companies prospered despite the onslaught of budget-priced foreign-made electronics. Joe Grado who began Grado Labs, in 1948, was and is first and foremost, an inventor and opera singer and audio designer. He's designed and built phono cartridges, turntable tonearms, headphones, microphones, and propellers. Julius Futterman was probably the least likely of any of audio designer to still have his designs, and variations of his designs, manufactured almost continuously for over fifty years. His hand-wired OTL amplifiers created a religious fervor among Quad owners such as Harvey Rosenberg, who later resurrected Futterman's designs at New York Audio Labs. In the 1950s,I had two relatives who lived in New Rochelle, NY that had mono tube fm Fisher receivers. If you had them on a good speaker system they sounded great. They had a feeling of "class" when I played with their controls and sonics. I use to hear Fisher stereo tube receivers play in a store around 23rd and Park Ave during the 1960s. I dreamed that I wish I had one of those units with the Empire Grenadier commode speakers. A 1962 Magnavox console that my family had ran on tubes and had a separate multiplexer in the cabinet. During the 1970s I built a Stereo 70 Tube Dynaco power amp and used it with a used Pas 3x preamp on Marantz Imperial 6G speakers. But in a Florida climate, the power amp was fighting the air conditioner so I sold it. My brother had two ESS 3 way Heil air motion tower speakers(AMT something) with Dynaco factory wired Pat 4 and a stereo 120 amplifier. That system sizzled. IMHO, the Pat 4 was an incredible pre-amp because of its sonic features but more so was the phono pre-amp section. There was some kind of circuit that retained the fullness of the sound but took out about 80 percent of the wow,flutter and rumble that worked better than any low filter. I also built an SCA-80Q int. amp in the 1970s. Good amp with unusally fine sound.